You know that Marie-Louise Rennicks is artistic as soon as you arrive at her front door. She has a small stained glass window in her garage and a beautiful mailbox decorated with folk art. Inside her hall, there is more folk art adorning her table, mirror and closet doors. As a child Marie-Louise was mesmerized with colours and colouring, but in school in her native Switzerland she had to be able to draw exactly what was in front of her. That she couldn’t do because she had a type of dyslexia, which she didn’t know about until later in life. Without encouragement from her teachers she became fearful and was failing at art. “I was totally crushed,” she said. An exceptionally artistic student from Uganda helped her get through. Top: When Marie-Louise Rennicks couldn’t find any tiles she liked for her kitchen backsplash, she created her own panels out of fused glass. Middle: Marie-Louise took an art class when she was 32 and she started with folk art. Here are two of the many things she decorated. 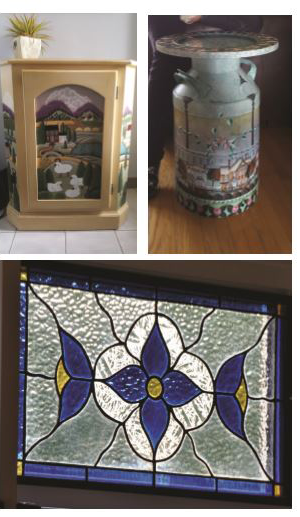 Bottom: After she moved to Centennial in 1997, Marie-Louise learned how to make stained glass. After school, she started working with banks. Since computer language was English, which was not one of Switzerland’s four national languages, they gave her a year off to study it. So she packed her things and came to Canada. She worked as a nanny and went to school at night and on weekends. Along the way, she met her husband on a canoe trip in Algonquin Park. He was in the middle of chiropractic studies so she decided to stay here. They had four children and it was when she was a stay-at-home mom that art came into the picture. “I needed something else for myself,” she said. “It made me realize how fear is so debilitating,” she said. She learned then that it was OK to fail and that it’s worse if you don’t try something. “It was a huge lesson for me.” Marie-Louise was 32 when she started folk art. She laments that she lost so many years of something she had a great passion for, but she hasn’t looked back. She even taught folk art in their home in Newmarket. In 1997, she moved to Centennial. By that time she was ready for something else and responded to an ad to learn how to do stained glass. After that she taught herself how to work in fused glass. She bought a kiln and figured out the firing schedule. Some things worked and others didn’t, but she wasn’t afraid to try. In 2010, she was accepted into a full-time adult art program at Central Tech and loved it. In that year she learned bronze casting, sculpting, painting, drawing, printmaking and ceramics. Marie-Louise had a show at Framing Dames for City Hotspots in 2014 and she has been part of the jury for Art in the Valley and Christmas in the Valley at the Miller Lash House. She also does commissions and her lovely stained glass angels hang in Grace Presbyterian Church.